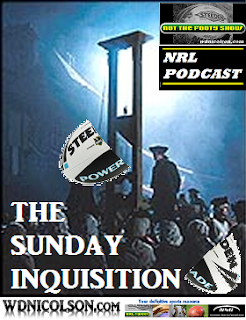 Welcome to the third edition of The Sunday Inquisition - a look at what the weekend of Rugby League threw up and why it should matter to you. Every Sunday for the rest of the season on wdnicolson.com - these observations will be presented in note form for your consumption. If you think we have missed anything don't hesitate to email the author and you will be credited with your contribution. Alternatively let us know via The NRL Tweet on Twitter. If you want game highlights, press conferences and Player of the Year Votes - look out for the Results Blog ever Monday. If you need a footy fix during the week - subscribe to our NRL Podcast - NOT The Footy Show - which is released every Thursday via iTunes. So here we go... the format may change as the weeks continue but we hope you enjoy the newest edition of The Sunday Inquisition. The format has changed slightly - Game Highlights and Press Conferences are being held over for the Results Blog - and the thoughts are a little more randomly added. Feedback welcome on what could be the best format - spread the word and comment with your own thoughts - this is a blog that is meant to get you thinking - so get to it. The NRLTweet's Results Blog covering Stats, Injuries, Game Summaries and Votes for The NRLTweet Player of the Year. 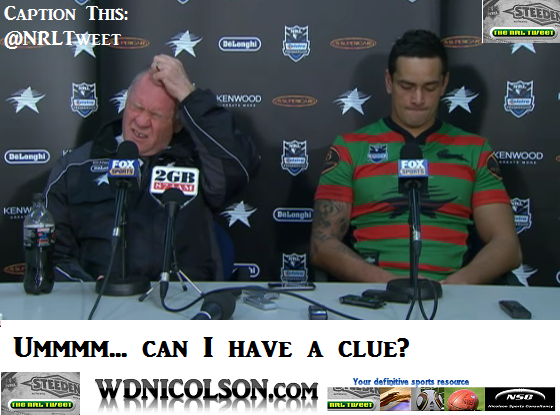 For the rest of the season there will be an opportunity for you to add captions to screen shots from NRL Press Conferences - a bunch of photos are already up so add your caption on our new Tumblr page. The most popular from last week was John Lang and John Sutton... click here to read the captions. To the Games... starting on Sunday through Friday. Or back through Friday as it were. South Sydney 34 St.George-Illawarra 22... don't really need to add anything to that other than the fact the Dragons were up 20-0 after 18 minutes... and up by 2 with 3 minutes left. The loss could prove catastrophic to St.George-Illawarra's home ground plans for the semi finals... a couple of weeks ago the question was which ground do we choose - Kogarah, Wollongong, the SFS or ANZ for our inevitable semi final... now the question is can they jump back past the Broncos and Cowboys and get their Top 4 spot back? At what point did South Sydney start believing they could win and conversely - when did St.George-Illawarra stop thinking they had to score points to hold onto the 2 points? Because the same thing happened last week... and worryingly for Saints - Canberra at least played okay in the 1st half last Monday, Souths were dead and buried on Sunday. South Sydney are still in the hunt for the semi finals... but they won't make it. The reason for this was Newcastle's 50-20 second half smashing of the Gold Coast not only moved them into 7th on the ladder - but they are now 2 wins clear with the Tigers on 24 points with the Panthers, Bulldogs and Rabbitohs all on 20 points and with the differentials of those chasing teams at least 40 odd points worse off - the Tigers and Knights basically have a 3 win buffer. Issac Luke not Chris Sandow was the catalyst for South Sydney getting back into that game... but in saying that Sandow was very good. Luke however, terrorised the big St.George-Illawarra forwards around the rucks. He is the best runner out of dummy half in the game... and the next best - Cameron Smith and Robbie Farah think playmake first and beat the tackle second. So Luke's keenness to beat the first defender is unmatched and as a result he gets those extra metres. Michael Crocker made a huge difference with his defence in the second half - the Bunnies are finally getting some value out of the veteran, as injury has limited him during his stay at the club so far. Dylan Farrell now has hat-tricks in 3 of his 23 NRL Games and each has sunk a heavily favoured opponent. He scored a hatty on début to beat the Tigers last year, his 3 tries built a South Sydney lead that held up to beat the Sea Eagles in Round 4 this year and then today against the Dragons. He also has 6 tries in his past 3 games... his centre partner by the name of Greg Inglis has 1. Someone sign Ben Ross for 2012 - you won't regret it. He's having a red hot go and making a difference in the middle. In Jarrod Mullen, Kurt Gidley and Ryan Stig - the Knights have a trio that can create enough opportunities to worry a big name opponent in September. The question however remains the forward pack - which while good - has to play above that level for the rest of the season to not only get Newcastle into the playoffs but for the Knights to do anything when there. They also need to stay healthy. Kurt Gidley's hamstring clearly isn't right yet he burned Beau Henry to set up Akuila Uate's 1st try... he's a warrior. John Cartwright watched (and directed to a degree) his team's performance from hospital (appendix) but is expected to be fine for next week. His stand in for today - Steve Murphy admitted the following after the match: "We're just breaking systems and rules that have been in place since our inception ... all technical things we pride ourselves on just aren't there at the moment." Am I the only one that is a little concerned it is the system being dated that is one of the issues in the Gold Coast's fall from grace? Adam MacDougall will finish his career at the end of 2011... he was in vintage Mad Dog form today and deserves an injury free run through the end of the season. Turns out William Zillman had an 'alarmingly high heart rate' when he got pulled after 41 minutes... at first I thought he'd just been pulled which made no sense given Jordan Rankin is not quite the player Zillman is at fullback. Zillman's time on the Gold Coast has been almost a complete waste of his talents bar a late run of form last year entering the Finals. Canberra's season was over in about Round 5 but David Furner might actually admit it now after the Warriors dusted the Raiders 29-10 in Auckland. The Warriors are playing very well right now and Feleti Mateo is in the form of his life. While I still don't quite get why he isn't on the field for 20 minutes a match (the opening 20) when he's such a second phase play machine - right now it is working for Ivan Cleary. A knee injury to Simon Mannering will be a huge concern for the Warriors... he is their heart and soul alongside Micheal Luck and if they lose either long term - they won't challenge in September. Kevin Locke is going great guns at fullback but still has a touch of - big game or no game - about him. Manu Vatuvei was enormous early but then went missing in the second half... he is the x-factor over there and the Warriors simply have to bring the game to him because he doesn't go looking for it enough. Josh Dugan was great for the Raiders and Shaun Fensom was his usually excellent self but the biggest positive for the Raiders was the form of David Shillington in his first game back from a pectoral injury. He was superb. Glen Buttriss was the chief instigator last week to beat St.George-Illawarra... but because the Raiders led heading into halftime today - Furner elected to keep Alan Tongue out there for the opening 9 minutes of the second half... it was a mistake. By the time Buttriss was on the Warriors had the lead and the momentum and the opening for Buttriss to make an impact had gone... as had the game with two tries from the Warriors ending the contest. Said it earlier this season but if James Maloney played in Sydney or Brisbane he'd be considered a star. He's playing great footy this season. The Cowboys kept their Top 4 hopes well and truly alive by finishing off the Panthers 30-18 in Townsville. Penrith had their chances but when Luke Lewis knocked himself out - he may have also knocked the Panthers out of contention as this loss saw them drop 2 wins out of 8th. Michael Jennings v Brent Tate was fun to watch. Kalifa Fai-Fai Loa's hammy injury is a big blow for North Queensland... because unless Will Tupou gets a recall or Brent Tate goes to the wing to accommodate Gavin Cooper in the centres... it means that Michael Bani might be back in first grade. Despite the off-field week that big Petero Civoniceva had - he was still one of the best ground. He will give his all for the Panthers, don't worry about that. James Segeyaro's big hit on Sam McKendry was a classic case of self preservation going out the window. And here is the link. Young Harry Seijka's début wasn't breath-taking but I hope Steve Georgallis perseveres with him for a few more weeks rather than using a stop gap at five-eighth. The Roosters and Bulldogs played out a high scoring game at the SFS but even though Sydney finished up 32-28 winners - the game was a great example of why both teams aren't going to be playing come September. Cannot for the life of me figure out why Ben Barba isn't a focal point of Canterbury's general attack... he seems to make all his big plays off kick returns, broken play or great off-loads from forwards. The Dogs never seem to feature him in backline plays... it's staggering. The Roosters had been building to that result for a couple of weeks but weren't fantastic and were lucky they were playing the Bulldogs. Why Mitchell Pearce didn't take the line on in Origin like he did on one occasion Saturday night is another great mystery. His right foot step is pretty good! Todd Carney can miss a tackle with the best of them. But he's not quite in the Chris Sandow or Robert Lui class - those lads are woeful at the best of times. Sandow's big hits on occasion help deflect his arm grabbing efforts on the edges. Phil Graham is quick but someone on the Fox Sports team suggested he almost ran down Ben Barba giving the Canterbury fullback 40 metres... had he caught him then maybe that statement had a place, but he didn't. Mose Masoe and Nate Myles either produced a superb chase to get Barba on his other break or were caught out not chasing down a clearing kick. Greg Eastwood will be a force for the Dogs in 2012... but their attacking game plan has to undergo a drastic overhaul. Can someone pass on to Jim Dymock that there's no time like the present to show your bosses that you can do that. I'll post my thoughts on Friday Night Football on Monday August 1. Justin Hodges scored a hat-trick but the Kleenex tissue softness of the tries Cronulla conceded was incredible. Colin Best had a shocking game defensively... but Shane Flanagan still made the wrong call benching him for that noted defensive superstar Ben Pomeroy. Cronulla might as well have played with 12 men in the defensive line given the options at left centre Friday. Chad Townsend was one of the few Cronulla players who could hold his head high after the game. Nathan Gardner didn't have a happy night but kept on trying. His volley on a Brisbane kick was the kind of gamble you take down by 30 odd points. Anthony Tupou is a shadow of the player we saw start out his career with the Roosters... few backrowers are as talented but he just lacks involvement of the most basic kind. He would need to bulk up again but I still think his best position might be prop or a middle of the park lock forward - to force him to stay involved rather than float out on an edge. Darren Lockyer's run to set up the hat-trick for Hodges was awesome. Watch it here. Manly did a fair impersonation of their 2010 form by blowing a 12-0 lead over the Wests Tigers in Gosford. The Tigers scored 3 tries in 7 minutes and then played some beautifully controlled football in the final ten to win 14-12. Daly Cherry-Evans was heavily involved for Manly but his 3rd tackle grubber for no-one was one of the few times this season he has taken a poor option. Brett Stewart blowing up at the touchie was disappointing. For a start had he taken Chris Lawrence's toes into touch he would've been penalised for making another effort after the tackle was complete and secondly when you carry on like that it hardly shows you in a great light. The touchie's reaction was to politiely inform Brett he might want to zip it up and walk away. You be the judge. Stewart also got bounced off deluxe by Lawrence on the very next play. Now I think Brett Stewart is a great player to watch but this kind of behaviour wasn't. It also ruined the accolades that his initial tackle on Lawrence would have gained him. Benji Marshall is a genius... but you knew that already. Benji Marshall's goalkicking regressed on Friday Night... it had been very good of late. Robbie Farah was robbed of two tries after team-mates forgot how to pass when in the clear... but at least he was there in support. William Hopoate was immense in his Origin 2 debut but in his two games back from a hamstring injury he has looked decidedly average... He's a better player than we've seen in recent weeks. Gareth Ellis would be the second backrower picked behind Nathan Hindmarsh in my team. That's how highly I rate him. This loss could've really hurt Manly... but thanks to St.George-Illawarra's own hiccup - they hold onto 2nd spot. But if the Storm beat Parramatta - Manly's Minor Premiership challenge looks over, as they'll be 4 points behind (+ differential difference) Melbourne with 5 games to play. If you have a thought on the footy this weekend - post it as a comment below. So there is the Sunday Inquisition for Round 21. If you enjoyed it please let us know how to improve it and we'll try to do just that. Make any suggestions in the comments below or via a reply and retweet on The NRL Tweet. Who are the Top 5 Props in the NRL right now? This question came about after Ray Warren called Petero Civoniceva one of the all time great front rowers in an interview he did on the NRL's Footy Show on Thursday July 28. Which got me thinking - where does Petero Civoniceva rate in the minds of the punters? Not all-time - as there's no doubt he's been a great player during his career - but what about right now? Are there any fans who wouldn't have him their Top 5? So the question was put to Twitter with the hashtag #Top5Props and it had 23 respondents in in four hours and they voted for the following 18 Front Rowers. In alphabetical order - the Twitter Poll will determine the final Top 5. When all the votes were collated a value was applied to each place. As a result this was was the final Top 5. Scott received 1st place votes from 22 of the 23 respondents and a single 4th place vote. Finished the runaway winner and had 23 total votes. While Petero didn't get a single 1st place vote, he dominated the 2nd place votes with 18 and received a vote from every respondent. Finished with 23 total votes. Tolman received the only other 1st place vote (Scott had 22 of 23) and only one 2nd place vote but he dominated the 3rd place vote with 8. Finished with 13 total votes. Hannant was just edged out by Tolman's strong 3rd place vote but he dominated the 4th place vote with 8 and had just one less 5th place vote than Mannah. Finished with 17 Total Votes and 17.0 Total Points. Mannah picked up a host of 5th place votes with 7 and managed to sneak in a few mid-place votes which helped him finish with 13 total votes and 13.5 Points. * Keep in mind one 'higher' vote may have boosted a player who received the same or less amount of votes as another player on the final ladder. If you have an opinion on who the Top 5 Props in the Game are right now - comment below. | We speak to former Manly and Canberra prop Mark Bryant about the demise of the Crusaders club in the UK Super League this week. How big a deal is Petero Civoniceva moving to the Broncos? The Rugby League Week Players' Poll, NRL Captions take off and can players like Jarryd Hayne expect to be treated normally or do they realise they'll be targeted by idiots when out? And to discuss this we've got regulars - Maria Tsialis, Nic McInerney and Dave Chapman joining Warrick Nicolson to dissect Rugby League. Plus we Review Round 20 of the 2011 NRL Premiership, while giving you our Special Fried Rice selections and tips for Round 21. 7:45pm (Local) 29 July @ Suncorp Stadium, Brisbane. 5th BRONCOS TEAM RECORD 12-6 for 28 Points, +50. 11th SHARKS TEAM RECORD 7-11 for 18 Points, -61. BRONCOS 7 SHARKS 3 - Brisbane won 34-18 in Round 13 earlier this year and did it easily. The Sharks haven't won since Round 15 of 2009. BRI: Hoffman, Beale, Reed, Hodges, Yow Yeh, Lockyer (c), Wallace, Hannant, McCullough, Anderson, Glenn, Thaiday, Parker. Bench: Gillett, Hunt, Hala, McGuire. CRO: Gardner, Williams, M Wright, Best, Stapleton, Graham, Townsend, Cordoba, Morris, Douglas, Tautai, Tupou, Smith (c). Bench: Snowden, Tagataese, Flanagan, Pomeroy, Mannah. SMH and Other Late Mail 29/07 - There is a strong chance Paul Gallen will play for Cronulla after travelling with the side to Brisbane. Darren Lockyer (hammy) is expected to play after training all week. 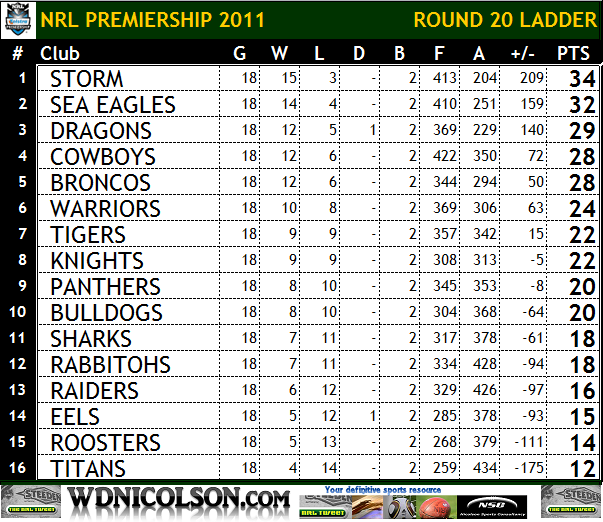 Latest... Paul Gallen remains a strong chance to play - roll the dice if he's in your fantasy team. Kade Snowden's shoulder shouldn't keep him out. DT reports Gallen won't play (at 12pm) and Tyson Frizell will make his NRL debut. BRONCOS To Win By 14 Points.